1. Know that every child is different; some 2-year olds are more mature than certain 4 or 5-years olds. If they like to play in the snow and have good coordination – these are signs they will take to skiing. 2. Watch a PG ski video, read a picture book about skiing, or play outside in the snow, to get your child excited about snow sports. 3. Have a fun downhill dress rehearsal before their first day skiing. Acquire rental skis and boots from a ski shop, resort, or buy used from a ski swap to try on and play with inside to familiarize your child before hitting the slippery slopes. 4. If you’re a do-it-yourselfer , keep the experience happy, safe and positive. As soon as the child’s interest wanes, its time for a rewarding hot cocoa. One run is better than none. 5. Don’t think that you’re not a good parent if you don’t teach them yourself – the opposite could be true. Ski camps are a great parenting decision. 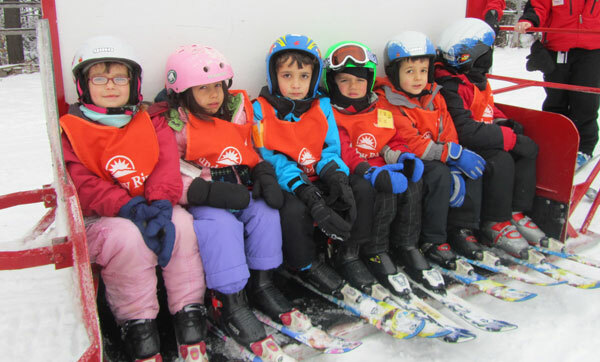 Today’s ski areas have experienced instructors and specially designed facilities with a track record of successfully teaching kids. 6. Call ski resorts in advance or go online to get the details on learn to ski programs and snowboarding lessons for young kids. See our list of the best family ski resort in the East and the top Western Ski Resorts with family programs. 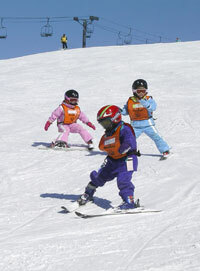 Resorts have all kinds of programs to choose from – privates, half day or all day camps. Reserve space by phone and confirm what’s included (i.e. : lunch, equipment), what to bring, location, times, so your first day is organized. Ask for registration forms in advance to expedite check in. 7. Ask about special deals on lodging packages that include free or discounted learn to ski programs. Avoid peak holidays and school vacations for the best prices, and fewer kids in camp. Smaller areas shouldn’t be overlooked; Gunstock, for example, offers experienced instruction without the big mountain premium. 8. Prepare your child for ski camp by explaining the day ahead, let them know they will be learning to ski like in the video. If you have signed up for ski camp, explain to your small fry that they will be with other children and a teacher while mom and dad go skiing until pick up time.Pack the proper gear and ski clothing for your child going to ski or snowboard lessons and all day camp. 9. Take pictures or observe from afar, but don’t interrupt the ski lesson or distract your child. Family oriented ski resorts like Waterville Valley have private observation area for parents to spy on their kids without being spotted. 10. Be enthusiastic, positive energy is contagious. Conversely, so is anxiety and fear.